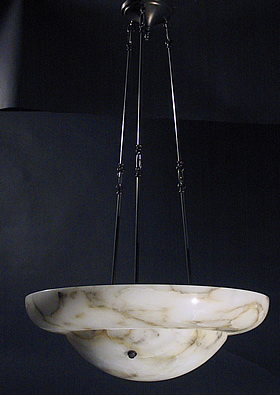 This wonderful Alabaster Inverted bowl would be a great light for a room like a library. The natural cream color veining would make a great compliment to natural woodwork shelving and multicolor of old book jackets. Antique alabaster fixtures feature bold veining as opposed to new alabaster fixtures which tend to be white with no veins. It is a style difference. New alabaster fixtures are probably thought to go well in contemporary settings and are therefore paired down to a large extent. Probably the need for a large quantity product line means that the manufacturer must reach the lowest common denominator which would be white with little variation. I think the approach was the opposite with these old bowls where individual character was desired.